The most effective way to beat crabs is to check out the range at which they are feeding. If the bait is being removed then shorten the cast. If it isn’t being touched, lengthen it. Sounds simple, but lots of anglers spend countless hours fishing without bait on their hooks because they fish timed casts and only react to bites. Your first cast will usually tell you how active the crabs are and from then on you can adjust your casting range to improve the bait’s survival time. It is common on many venues to find that crab activity ceases the minute the fish come on the scene – something many anglers are unaware of. In extreme situations there are a number of solutions, and the easiest is to position floating beads as close to the bait as possible. This method works for some species, like flounders and plaice, because it lifts the bait away from the sea bed where the crabs can’t get it. There could be a problem, because crabs can swim, but floating beads do make it more difficult for the crabs to remove bait. There are lots of buoyant beads available and they come in various sizes and bright colours. 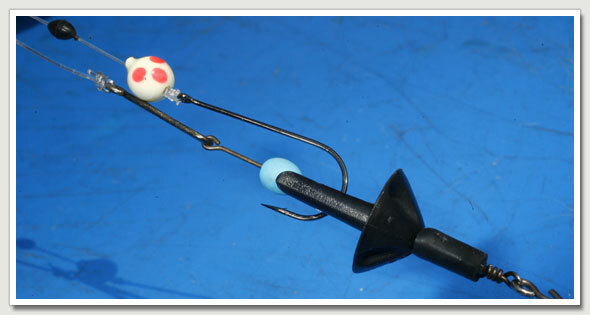 Site the beads as close to the bait as possible using a stop to hold them in place. Floating beads work well most of the time, but there are species that won’t swim away from the sea bed. 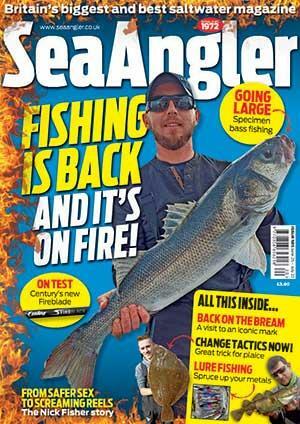 Species that do include mackerel, garfish, bream, pollack, pout, scad, bass and coalfish. You can also use a flounder spoon and retrieve the bait slowly over the sea bed. This method can work well in estuaries where hungry crabs can clean hooks of bait in minutes. Various beads can be added to the hook snood to introduce colour, noise or lift. When you sense a bite, stop reeling and pause for the fish to take the bait. Try a float-fished soft crinkly crab, one that has already peeled and is still soft. Hook it through the side or rear shell so it stays alive and suspend it under a float for bass when fishing from a groyne or pier. 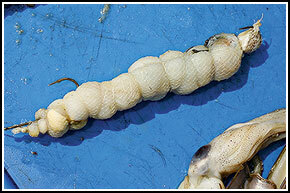 A tail-hooked prawn attracts lots of species and is deadly when freelined or fished live under a float. A live sandeel can be presented in the same way. Carp anglers have long used a soluble mesh bag or net to deposit particle baits alongside their hookbait. Now they are experiencing much the same bait-robbing problem as us, but from small catfish. They have found a way of protecting their baits by using Arma Mesh, a tough material that doesn’t dissolve and can also be used by sea anglers to keep crabs off sea baits. There are various ways to increase a large bait’s staying power. Wrapping a prepared crab or fish bait inside a squid mantle is one. The procedure is to clean the skin and fins from a calamari squid, lay it flat and bash it with the knife handle to perforate it, which allows the scent to escape. Load the main hook (a Pennell rig is best) with the squid and then use elastic cotton to wrap the squid around the crab in a sausage. Use Arma Mesh to encase the bait. Then nick the top sliding Pennell hook in the top of the bait to support it and the mesh. This adds extra protection to your bait from bait thieves. Change the bait every cast. Another method is shown below. 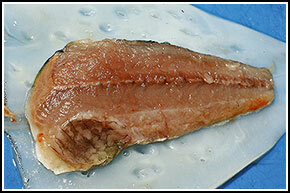 Cut a fillet from a Bluey, mackerel or other fish. Clean the squid, then bash with a knife handle. Place fish fillet on top of the prepared squid. Any any other bait, such as a razorfish or mussels. Fold the squid over to create a bait casing. Push the bait into the Arma Mesh package. 8. Hook the packaTrim the mesh and hook the bait on a Pennell rig. There is no real answer to spider crabs nipping through mono snoods as they devour your bait, other than to check snoods regularly for damage. If you are fishing for the larger species, then increase the diameter of the snood line and use tougher fluorocarbons. Continental anglers use a short solid wire biting trace to protect their rigs and you can make one by using a short Gemini Genie boom clipped directly to the hook. Alternatively, a short biting trace of 80lb Spider wire will make the rig relatively crab-proof.